Medieval News: Medieval Badge with Three Lions Discovered - an omen for England at the World Cup? Medieval Badge with Three Lions Discovered - an omen for England at the World Cup? The discovery of a medieval artifact in Warwickshiure is raising hopes that England's football team will have luck on their side in the World Cup. Caroline Rann, a field archaeologist with Warwickshire County Council’s Archaeology Projects Group, has recently found a 13th century copper badge emblazoned with the three lions, an emblem very similar to that of the country's football team. 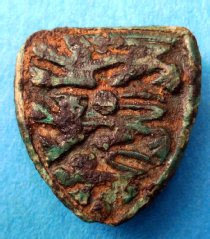 Caroline Rann said: “I found the badge when I was investigating a medieval stone wall in Parkside, Coventry. The badge was lodged between the sandstone blocks and may have fallen in while it was being built. The badge, which may have originally come from a horse harness, is believed to be from the 13th century. The three lions of the arms of England was first used by Henry II (1154-89) who added a third lion to the previous coat of arms, which only had two. This continued up until 1340, when the royal coat of arms was quartered with those of France in order to back up Edward III claim to the French throne. The archaeologists were working on behalf of Provision for the Christian Life Ministries at Parkside in Coventry, as part of the planning process. Could Medieval Mason's Marks make a comeback?